Pioneer BDP-LX58 review | What Hi-Fi? Spending £600 on a Blu-ray player may seem excessive when you can get a decent-performing one with more smart features for a sixth of the price. But if you are a home cinema enthusiast dedicated to getting exceptional picture quality, we’d say the Pioneer BDP-LX58 Blu-ray player is well worth it. The more affordable of Pioneer’s two premium models (the pricier BDP-LX88 received four stars in our March issue) is first and foremost about performance. Even our award-winning Panasonic DMP-BDT700 can’t quite muster the Pioneer’s incisiveness when it comes to depicting outlines. Its picture is easily the crispest (and shrewdest) we’ve seen at this price, packing a punch that keeps your eyes transfixed on the screen and involved in the movie at all times. Play a Coen Brothers favourite, Fargo, and the snowy Minnesota landscape leaps off the screen. The deep blackness of tyres, shoes and buried suitcases look striking against it, and there’s a good level of detail in either extreme. Punchy and well-grounded, colours are clean and convincing. The Pioneer has no trouble discerning the dark browns from the blacks in the police officer’s wax coat, and skin tones have a natural warmth to them. Colours can appear a little on the vivid side – the redness of bloodied snow, for instance, is intense – but they don’t ever quite cross the threshold to looking overdone. The BDP-LX58 paints with a super fine brush, too, the woodland trees in the backdrop displaying a greater definition than its rival Panasonic. Even as night falls on our kidnappers, the Pioneer delivers detail and clarity. It also puts in the work with DVDs, making upscaling look easy. Drop resolution to Who Framed Roger Rabbit? and outlines hardly lose their cutting edge. Whether it’s the red buses, green billboards or Roger’s yellow gloves, colours remain eye-grabbingly bright and punchy. Elsewhere, picture noise is low, and the image remains blur-free as cartoons whizz across the screen. Sound quality doesn’t let it down either, the soundfield nicely focused and balanced as we replay Fargo. Gunfire is backed by decent solidity, as is the shattering of windows as the kidnapping proceeds. Further cross-comparison with the Panasonic reveals the Pioneer’s richer dialogue and clearer, more dynamic delivery of the film’s string-led score. 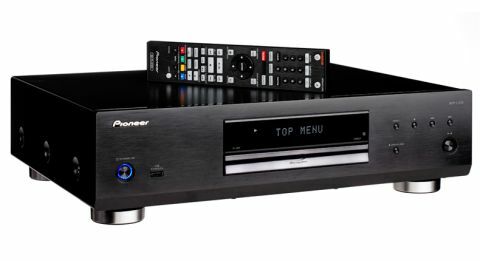 For a Blu-ray player of this price, the Pioneer’s music replay is certainly up to scratch. The music format compatibility is unusually vast (it can play high-res files, SACD and DVD-Audio), which is good news. You don’t get the same refinement, organisation or musical nuance you would from the best dedicated £600 CD players, but load up Alicia Keys’ If I Ain’t Got You and piano sequences are full of life and body. The delivery isn’t quite as smooth as the Pana’s, but we prefer its sense of drive and better grasp of low-level dynamics. Despite being under half the price of its bigger sibling, the BDP-LX58 can still boast the majority of its better features: Ultra HD 4K upscaler (not a given at this price), 3D playback and high-res support for DSD 2.8MHz and PCM files (inc FLAC and WAV) up to 24-bit/192kHz via USB or streamed via DLNA. You might expect a drop in connectivity from the well-equipped BDP-LX88, but it remains largely the same – save for the absence of balanced analogue outputs. A coaxial and pair of RCA outputs should be satisfactory for most, though. Two HDMI outputs are also sufficient, as are two USB slots (one at the front). Last but not least, a LAN socket (you need a separate dongle for wi-fi connectivity) gives you access to its built-in smart apps, YouTube and Picasa. When we reviewed the BDP-LX88, we were puzzled by the omission of BBC iPlayer and Netflix apps, and even at half the price we feel shortchanged by their absence. But with many home cinema products (especially tellies) cramming in smart software, there are plenty of other ways to get them. While the LX58 uses a less advanced Sabre32 ES9011 DAC to the LX88’s chip, Pioneer’s Precision Quartz Lock System (PQLS) technology is still present. It helps minimise jitter when connected to a compatible Pioneer AV receiver, meaning that when the two components are connected via HDMI, PQLS lets the AV receiver take control of the Blu-ray player’s digital clock, which, Pioneer claims, will eliminate any distortion caused by timing errors in signal transfer. Pioneer’s Sound Retriever Link and Stream Smoother technology, designed to enhance compressed audio (MP3, WMA) and video (MP4, WMV) files when used with a Pioneer AV receiver, are further attempts by Pioneer to get you to buy into its family. More comparable to the sturdy construction of an amp than the garden variety of Blu-ray players, the Pioneer’s rigid chassis (made from aluminium and steel and reinforced with an iron plate) is certainly built to last. Both quality and finish feel and look great – especially considering it’s almost the spitting image of the doubly-priced BDP-LX88. There’s a bright and clear LCD screen and the remote control is easy to get to grips with – if a little cluttered. Alternatively, smartphone owners can take advantage of Pioneer’s intuitive iControlAV5 app. There’s a lot to be said for a quiet-running machine, and the Pioneer is just that. From loading up a disc in the tray mechanism, right the way through to playback there’s barely a sound. With a favourable review of one of its flagship products under its belt, and its £1400 SC-LX58 amplifier our current Award winner, Pioneer has been flaunting its competitive streak in the high-end home cinema department. The BDP-LX58 is another fine achievement. Features-wise, it isn’t the smartest disc spinner we’ve come across, but we find the lack of apps easier to forgive when performance is up there with the very best. If you’re looking for a jaw-dropping movie experience and want to take the next step in upgrading your system, this Pioneer is a great place to start.